Our favorite Impressionist painter is Claude Monet and TJ & I decided to revisit an old art project we had done a few years ago - inspired by Monet's Japanese Bridge paintings. It's a simple project but has a few different steps and techniques. It's fun and we're both sure that you and your kid will enjoy it as much as we have! 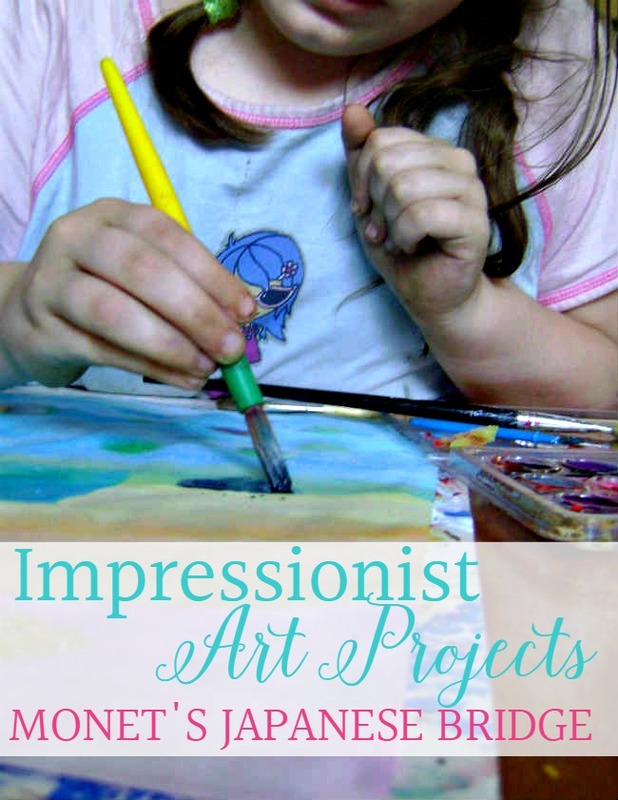 So let's look at more Impressionist Art Projects for Kids: Monet's Japanese Bridge. project inspired by: Dream, Draw, Create! Monet was inspired to paint right in his own garden - and we're inspired by his work. 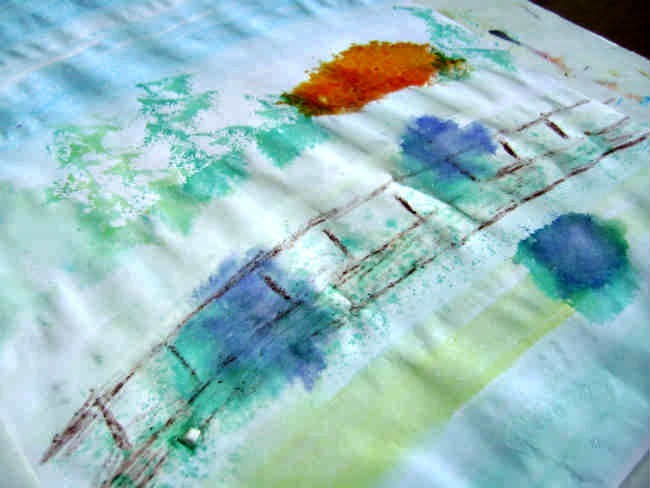 Using his Japanese Bridge paintings as inspiration, you and your kids will create your own watercolor picture. Start by preparing your area - lay down an art mat, fill a small container with water, put a small amount of sea salt in a little container, and get your paintbrushes and supplies organized. Take your paper and place it so the short edge is facing you - you want to create a longer, vertical image. The first step is to create a wash of color, working quickly, down the paper. Decide what colors you'd like in the sky and the water and use your watercolor paint to create the affect you'd like. 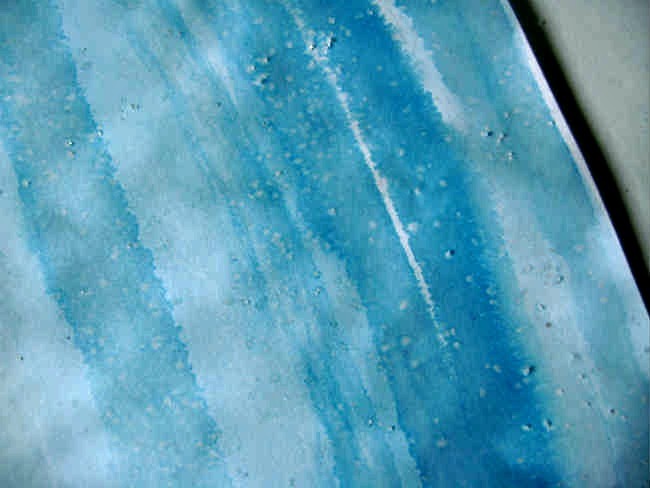 Next, pinch some sea salt between two fingers and sprinkle it lightly over the surface of the paper onto the wet paint. As it dries, it creates a neat effect on the watercolor paint. Now you want to create some depth in your picture - add scenery, bushes, water lilies, etc. 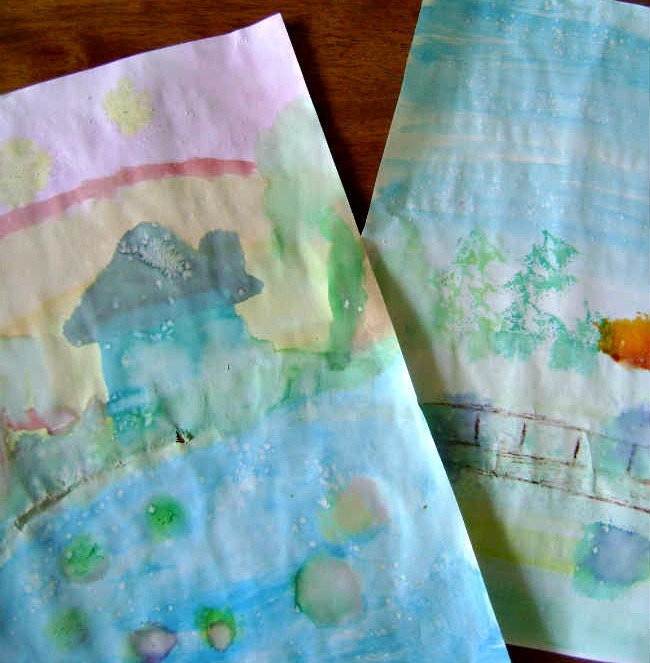 with the watercolors, brushes, and pieces of torn sponge (the corner of a torn sponge makes a great print for a tree), being sure to leave space for your bridge in the middle of the page. After you're satisfied with your artwork, it's time to add the bridge. Using an oil pastel, create a curved shape from one edge of the paper to the other. Draw on a handrail and any other details you'd like to include. Dab your sponge here and there along the bridge with a bit of green paint to make it look like there is ivy dripping down. That's all there is to it! You've created your own Monet inspired work of art.